As a volunteer with the US Peace Corps, Jeremie Gluckman (pictured at center) taught Engilsh to students in Guizhou, China. He received his IB Diploma from Indus International School, Bangalore, India. It all started in the spring of 2014 with a much-anticipated email informing me that I would be heading to Chengdu, China for training that summer. I had spent the year working part-time and interning in Washington, DC while I completed the lengthy application process, obtained medical clearance and finalized paperwork with the US Peace Corps. I was so excited about the opportunity to leave the office and learn from real-world experience abroad. I’ve now been volunteering for two years at the Guizhou University of Finance and Economics. I teach 18 hours a week to help over 500 students each semester improve their spoken English. There are many ways that the IB Diploma prepared me to rise to the occasion, but this is how the IB Learner Profile equipped me for service with the US Peace Corps. …internationally minded people who, recognizing their common humanity and shared guardianship of the planet, help to create a better and more peaceful world. Peace Corps volunteers receive training in areas ranging from intercultural competence, diversity and inclusion, language skills, technical training related to volunteer work, and much more. Trainers aren’t there to educate. Volunteers are given tools, and it is up to them to put two and two together, ask the right questions, and advocate for or create what is needed to serve successfully. I’ve been encouraged to nurture my inquisitive spirit throughout my educational journey, and this has served me well in my experience adapting to the culture of the Peace Corps and life as a volunteer university lecturer in Guizhou. As IB graduates, we are engaged in interdisciplinary learning throughout our lives. I’ve piloted innovative projects as a volunteer in the Peace Corps. Recently, I’ve been exploring how to use the internet to create new cultural exchange opportunities on Tumblr and Youtube. The IB was a big part of why I thrive when working at the intersection of disparate fields. Convening an American dance practice and history club while a US Peace Corp volunteer helped Jeremie’s students practice English and explore unique ways of communicating across cultures. I’ve shown initiative within the Peace Corps China country office by helping spearhead a volunteer support restructuring effort and visioning process. Though seemingly unrelated, specialized knowledge in different areas equips IB graduates with the ability to thrive in complex environments. I know how different disciplines generate lenses to frame issues and make problems more manageable. I use critical thinking skills pulling from this awareness to provide creative solutions. This capacity to think different and take responsible action has been a huge asset during my service. As an immigrant from France, I grew up speaking French and English at my family home in California, USA and attended a French-immersion school. I learned to speak Spanish during my high school years in India and now have intermediate proficiency in Chinese. Living and immersing myself in many cultures, I’ve learned that it is important to create space for and anticipate miscommunication (because no matter how hard you try, it will happen.) In addition, adopting a mindset that allows one to learn and grow alongside partners from another culture when communication falls prey to powerful intangible cultural nuances. What stands out about my experience completing the IB Diploma at Indus International School, Bangalore was the relationships I developed with the teachers and mentors who helped me thrive. It’s been interesting for me to find myself taking on the role of teacher and mentor as an education volunteer in China. I never imagined it would be so challenging. At crossroads in my service where I wasn’t sure how to manage a situation related to supporting my students, I’ve thought back to how these educators in India helped unlock my fullest potential. 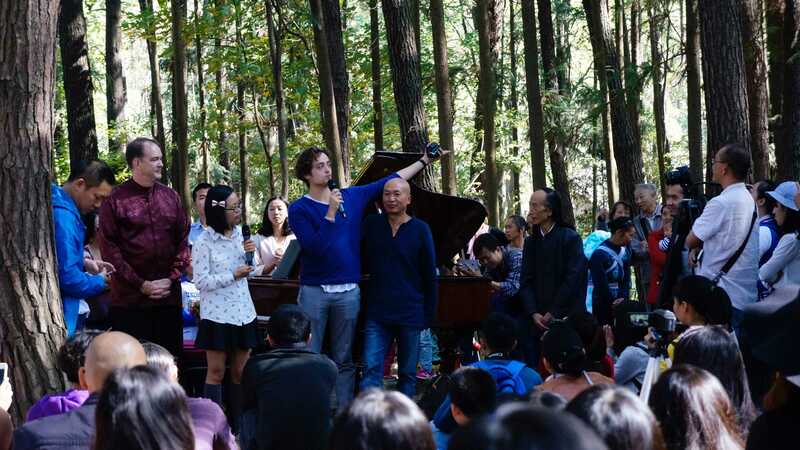 Jeremie addresses the audience during a piano concert at the Yelanggu Artists Residency near the Guizhou University of Finance and Economics. It wasn’t until I joined the Peace Corps that I became aware of my limited understanding of identity in both America and China. As an IB learner, I always felt welcome and encouraged to vocalize and explore my identity and was part of a community who felt comfortable hearing perspectives that differed from theirs. This critical understanding helped me effectively respond to instances of discrimination that I’ve witnessed among Americans in the Peace Corps. Working in China, I’m able to evaluate different points of view and take it upon myself to grow from that experience. A big part of Peace Corps service is the people-to-people connections that you forge, but these can sometimes get diluted in data collection and reporting mechanisms. I’ve learned that the human touch, inspiring stories, and connection are what moves people not reports and data. Empathy, compassion, and respect need to be at the core of any exchange or development program. Achieving these and embedding them in your work is extremely challenging. Many of the young people I serve are studying far from home in what for many reasons is a challenging and under-resourced educational environment. In my work as an educator, I’ve managed to reflect on my own assumptions and pre-conceived notions and therefore gained a genuine understanding of student needs to design relevant coursework structures. In this process, the most unexpected result was that I started developing a deep sense of care for my students and their wellbeing. I was worried about joining the Peace Corps as a gay man. I had the foresight to have conversations with leadership at the country office about the gender and sexual diversity landscape in China and had already identified key areas of need to enhance support for the entire GSD community serving in China before I moved there. I took a leap of faith and consciously put myself in a vulnerable position. The Peace Corps is working on making the institution more inclusive. I’ve seized the opportunity to be a vocal member of the community and continue to innovate in this area of work. Pause and reflect has been my motto during Peace Corps Service. Because surviving on limited resources in a foreign culture and operating within the culture of the Peace Corps is extremely stressful I’ve learned to embed mindfulness and self-awareness in my daily life. I can adjust my behavior and attitude by reflecting on my goals, aspirations, and motivations to ensure success. 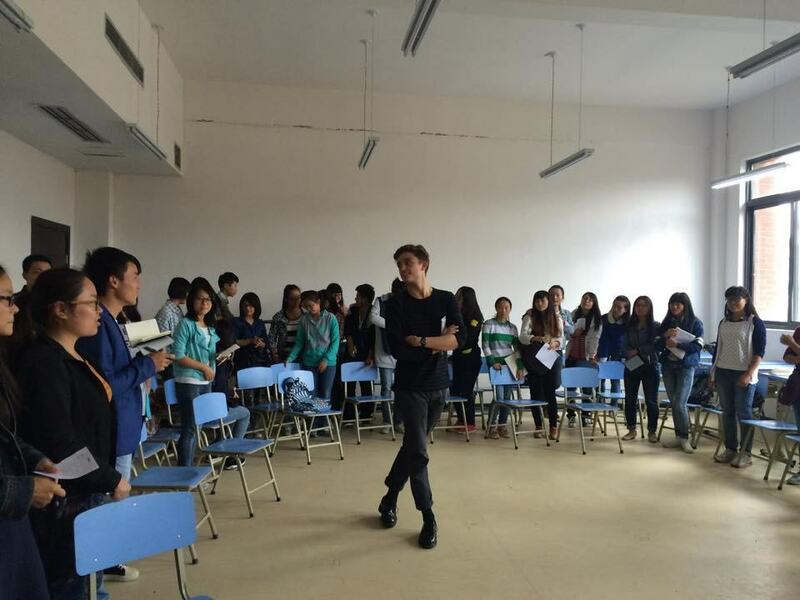 Alumnus Jeremie Gluckman writes from Guizhou, China. 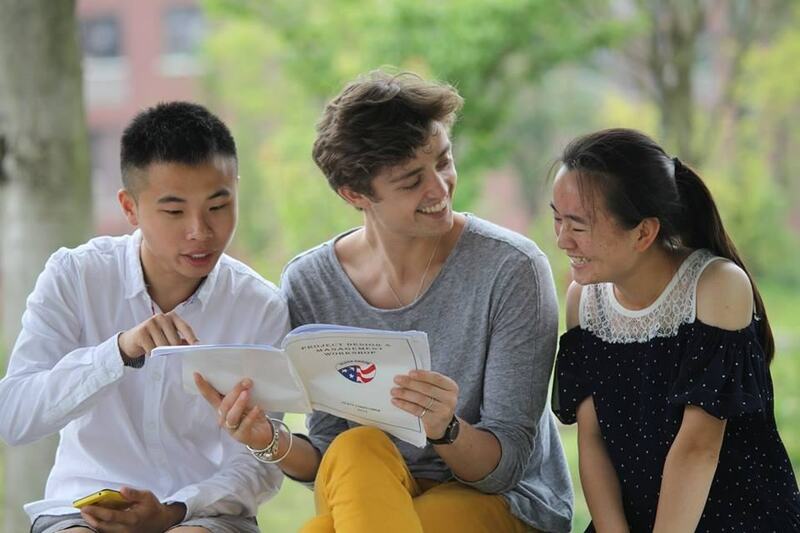 This year will mark two years of service as a US Peace Corps volunteer teaching students in Guiyang, China. He received his IB Diploma from Indus International School, Bangalore, India.